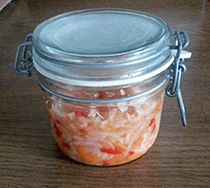 ‘Kimchi-Kraut’ – A spicy fermented hybrid! 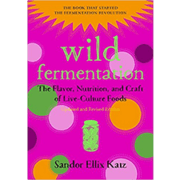 If you’ve been following me for any time, you’ll know I feel strongly about the inclusion of live (fermented) food in the diet. To summarise my views on the subject: Super good for you, easy and fun to make, tastes amazing! I’ve only tried to make Kimchi once. It’s a spicy, pungent ferment with loads of garlic, ginger and chilli, which is a bit of national obsession in Korea. But the recipe I have is a little bit more involved than I’m used to, and includes Mooli, a kind of enormous oriental radish, which isn’t the easiest thing to get hold of. So I experimented, and came up with this recipe. 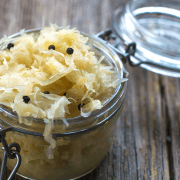 It’s basically sauerkraut made with kimchi-like flavourings. I call it kimchi-kraut. And it’s lovely, if I say so myself! The hardest bit is the chopping. Prepare everything as above, aiming for the thinnest slices you can manage. Once it’s all prepared, you can begin the preparation, which is the same as for sauerkraut. Get a large glass jar (like an office-sized coffee jar) and begin to layer the ingredients. You don’t have to be too careful, just try to make sure they’re going into the jar a bit mixed up – For instance, a handful of cabbage, some carrot, some radish, bit of garlic, chilli and ginger, big pinch of salt, then start again. Every now and then take a wooden spoon, rolling pin (or your hand if it fits in the jar) and firmly press/pound the ingredients down into the jar. This ‘bruises’ them and helps them to release their juices. Once you’re finished, get a smaller jar (a jam jar, perhaps) that will fit inside the neck of the big jar. Fill the small jar with water and screw on the lid, and put it on top of the cabbage mixture to act as a weight. Now cover the big jar with a tea towel to keep dust and flies out. That’s it – you’re done. Now you just put the jar somewhere warm, and wait for fermentation to begin. After 24 hours you’ll find that liquid has appeared in the jar. It’s the juice from the veg, which has been drawn out by the salt. MAKE SURE that it completely covers all the veg. If not, top up with water. (The advantage of using radish is that it has lots of juice, so topping up is unlikely) You must make sure that no veg is sticking out the top, or it will rot. After another 24 hours or so you should see that bubbles are beginning to rise in the brine. This means fermentation has begun. Check the jar daily to make sure that the veg is submerged, and have a taste. You can leave it anything from just a couple of days to a couple of weeks. 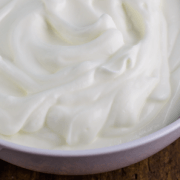 The flavour will get more sour the longer it ferments, and the health benefits will get greater. When it reaches a stage you like, decant into smaller jars and move to the fridge (again, making sure that all the veg is below the liquid in each jar – top up if necessary) Once in the fridge fermentation is halted, and it will keep for many months, probably years. 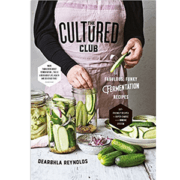 Use as a pickle/condiment with salads, cold meat, curries, sandwiches etc. 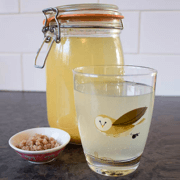 Kombucha: Homemade, fermented, probiotic joy! https://www.neilkingham.com/wp/wp-content/uploads/2014/07/kimchikraut1.png 188 210 Neil Kingham https://www.neilkingham.com/wp/wp-content/uploads/2016/04/logo-painted.gif Neil Kingham2014-07-18 10:09:012016-10-03 17:22:27'Kimchi-Kraut' - A spicy fermented hybrid!